Now that my students are wrapping up their summer research activities, it’s time to share some of my new designs. 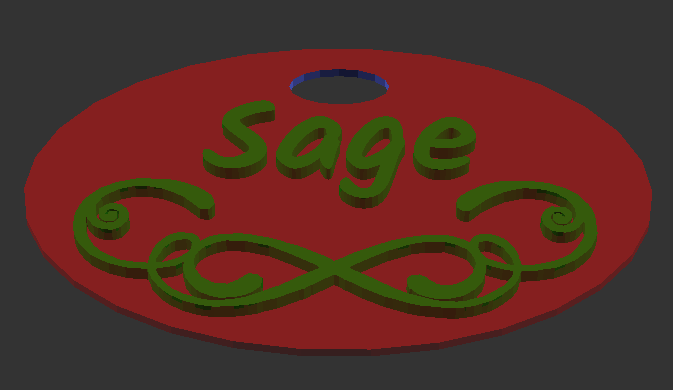 This one is inspired by my students – they wanted to design and 3D print keychains – and Rozenn’s request to have name tags for our plants. 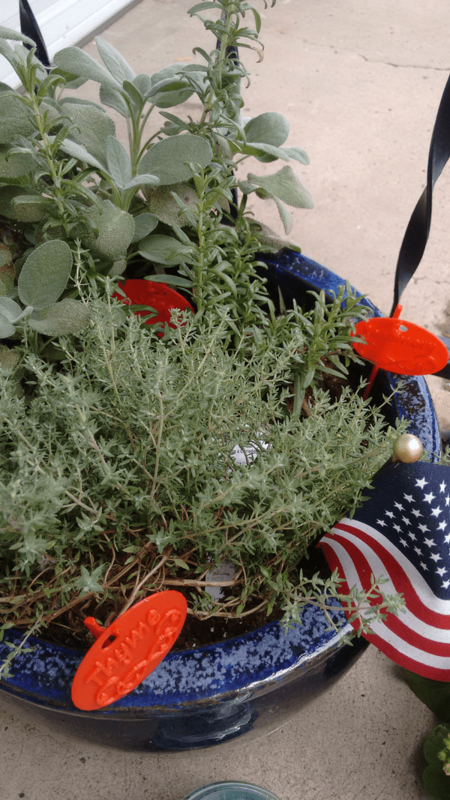 Rosemary, thyme and sage, with a bit of patriotism to boot. Read on to see how I designed these, which involved a little bit of magic for the swash ornament. Yep, I had to search for the definition of swash ornament myself, but more on that in a minute. The plant tag is a fairly simple design consisting of an oval plate with a hole in it, some text and the swash ornament. I’m a fan of OpenSCAD for designing my 3D prints and making shapes is pretty straightforward. In the code block above, linear_extrude is used to convert a 2D object (the circle) into a 3D object. I used scale to squish the circle into an oval. To cut out a hole in this plate, the difference operation is used. Text can also be added in the same fashion; the text function creates a 2D text object which can be converted into a 3D object via linear_extrude. I used Kalam as the font for my plant tags. The swash ornament was a bit trickier. I suspect someone has figured this out, but I know of know mathematical or geometrical representation of swash elements to make them using the tools available in OpenSCAD. Therefore, I found one that I liked and saved a screenshot of the image. OpenSCAD does have the ability to import an image via surface but the image needs to be processed and it is a bit clunky, so I decided to take a different route, which is arguably more clunky than doing it in OpenSCAD: Mathematica! This is what happens when you do ““Dilation[Binarize[ImageResize[img, 600]] // DeleteSmallComponents, DiskMatrix] on a swash ornament. Full disclosure: a scaling transform was added to make this object look pretty, but you don’t really care about the details. Finally, we have an object that can be saved as an STL file and imported into OpenSCAD. I can’t 3D print multiple colors … yet. The last part, which I won’t bore you with, is to make what amounts to a 3D printed swizzle stick in order to hang the tag in the pot. It’s a few cylinders at right angles, and is not exciting at all (and you’ve just witnessed what I think is exciting, so imagine my threshold for boring). Hmm, maybe I need my students to come back in to the lab so I stop sharing. This entry was posted in Make and tagged 3D Printing, Mathematica, OpenSCAD. Bookmark the permalink.